What is a story grid? You’ve got a great idea for your TV pilot or spec – now what? Well, the pros start by “putting it on the board.” Before we tackle writing the script or even the outline or a beat sheet, we break our stories on note cards or a white board. We break the broad strokes of our story scene by scene. This creates a story grid. In The Hero Succeeds, I give you all the details about using story grids to fit an entire pilot on one page. This way you can see your whole story laid out in front of you. You can rearrange scenes easily and see how moving scenes will affect your story. To get my free story grids for Stranger Things and Mr. Robot, click here (or here if you have popups blocked). 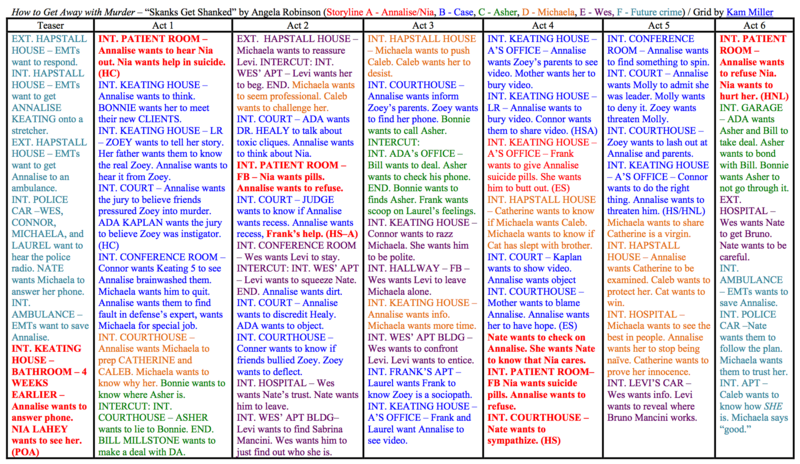 The pros use story grids and boards because they are the fastest ways to break story. With story grids, we don’t have to invest the time writing the script, only to figure out we need to scrap a bunch of scenes, rearrange a storyline, or worse, do a page-one rewrite. Getting your story on one page isn’t easy. However, once you do have your emotionally satisfying story on one page, you’ll be able to start your outline and script with confidence. If you write concisely and focus on your characters’ wants, a one-page story grid will equal the length of a half-hour comedy or one-hour drama. If you have too much for a one-page grid, your script will likely be too long. Plus, you can whip out that story grid as a reference during your writing process. One page travels really well, so if you’re on a plane, on the beach, or at the coffee shop, you’ll have your entire story handy.